Where I’ve Been (with my dad): Happy Belated Birthday Dad! Just like my post for my mom, this one is late too. I wrote this back in September but it never felt fully edited. It still feels not fully done but I figured it’s better late than never! For those of you who know him, this may come as a shock: my dad isn’t perfect. (Sorry Dad!) 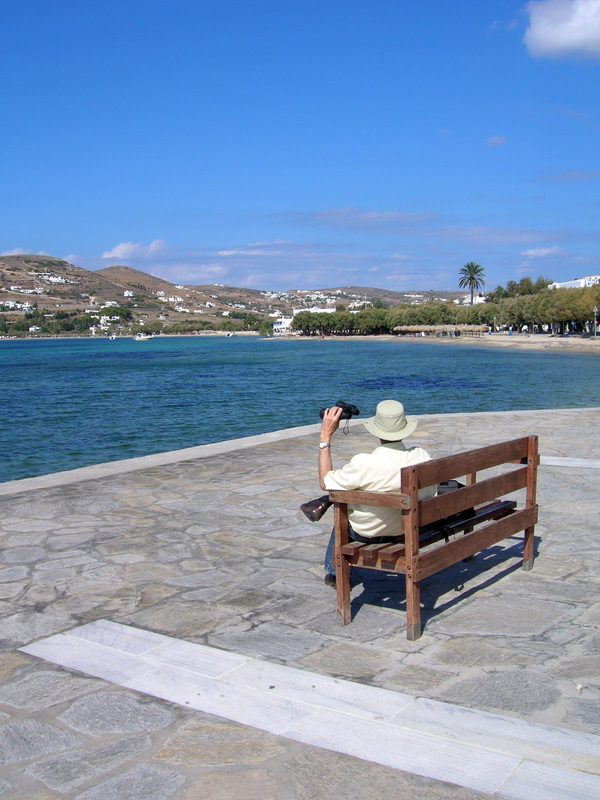 Yep, my dear old dad has a flaw: the man doesn’t take enough time off to relax. Fortunately, I did not inherit this trait. I may have his long Taylor arms and my sister may have his steely blue eyes, but neither of us have ever had a hard time taking a good old-fashioned vacation. The good news is that this aversion to relaxation is lessening with age. Several times when I called him last summer he was out playing golf. You’ll beat this work thing yet, Dad! I first realized all hope wasn’t lost when we were on the trip to Mexico when I was in middle school. Other than the few times he called to check in with his business, he did actually relax and have fun. But alas, when we packed up and headed back up across the border, things were more or less back to normal. But like I said, the situation is improving. Prompted by a triumphant battle with cancer (yay Dad!) and a nephew who was marrying a British gal, my dad up and got his passport and went to England in 2010. Then, a few months after his return he generously invited me to accompany him on another excursion, this time to Italy. Since he didn’t seem to have his heart set on Italy and Italy alone, I used the power of suggestion to change his mind to Greece. I’d already been to Italy twice, but Greece would be an uncharted territory for the both of us. I believe the words boats, ferries and ships were some of the major points of my pro-Greece persuasive argument. So off to the land of the feta cheese and Greek Gods we went. Relaxation 101: Get a good cup of joe, a good view of a historic site and some good weather. Traveling with someone who’s new to traveling, can be an eye-opening experience. 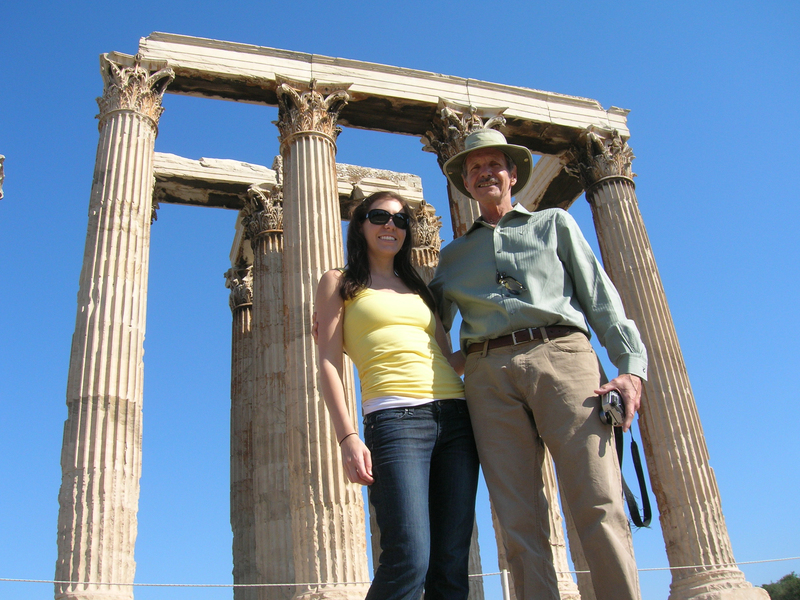 Between reminding them to keep a better eye on their belongings (his wallet got lifted in the first 20 minutes of our Athens touchdown) and posing for the millionth picture, you start to reminisce about your own first trip or two. 1. Know when (and when not to) take charge. Sure, you may think that taking charge will be easier for everyone, but before you go all bossy-britches, think back to your own first trip – chances are you had to muddle through rushed layovers, train schedules that didn’t add up and confusing street signs and you came out the other side just fine. Obviously, don’t stand back and let your party miss a plane, but keeping everyone in the loop and going through the figuring-out process together will give any travel newbies the confidence to conquer new land themselves. 2. There are no stupid questions. When my friend Jenn and I first arrived in France, bright-eyed, bushy-tailed and bewildered, had it not been for her Mom’s last minute insight, we would have had no idea that restrooms were called WC. The next year when my sister and I touched down in Amsterdam for my second European adventure and her first, I found it crazy that the whole WC thing wasn’t common knowledge to her. Like any younger sibling who had spent her whole childhood being constantly less-knowledgeable than an elder sibling, I got a kick out of making her feel foolish. This isn’t really what you should do. 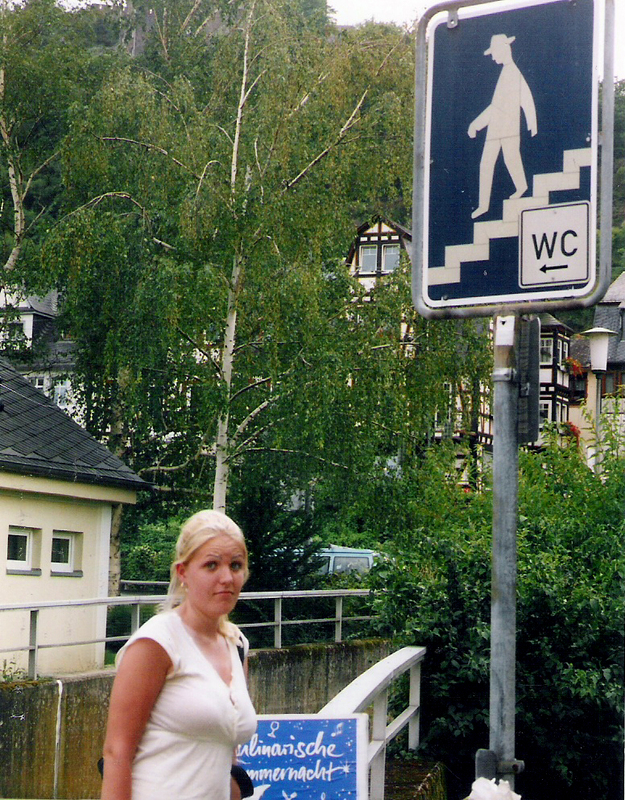 My sister in Germany, at this point, fully versed in the meaning of WC, but still not about to go down into this one with the sketchy guy on the sign. 3. Two people = two trips. Anyone who has ever been part of a traveling duo knows that no two people ever have the exact same idea about what constitutes an ideal trip. The key to traveling well with anyone, in any circumstance, is being able to do things sometimes together and sometimes apart. Just because it may be your companion’s first or second trip doesn’t mean this is any less true. Sure, you feel like their experience should be more special than yours but if you fall into that trap, not only are you setting yourself up for a day of potential annoyance but you’re depriving that person of learning to travel solo, even if just for an afternoon. One of the afternoons when my dad and I were in Athens he wanted to take the metro to the harbor to check out the ships. Even though it sounded painfully dull, I almost went with him because I felt like it was his trip so I should do what he wanted – but that’s just crazy. He didn’t really care one way or the other and I probably would have convinced him to return sooner than he really wanted to. Instead, I helped him find the right train and then treated myself to an afternoon of shopping along Ermou Street and eating gelato. 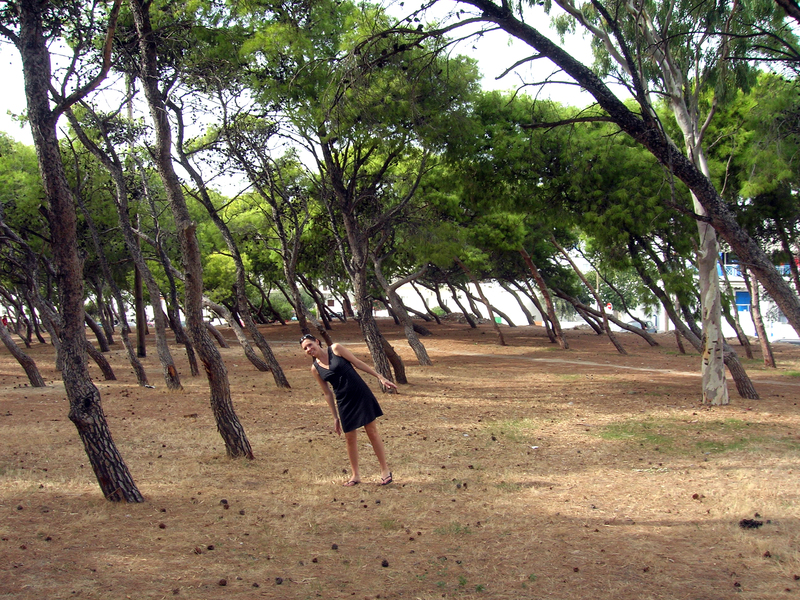 We each thought it was the perfect way to spend the afternoon in Athens – and we were right! Also, I bought a super cute bomber jacket. 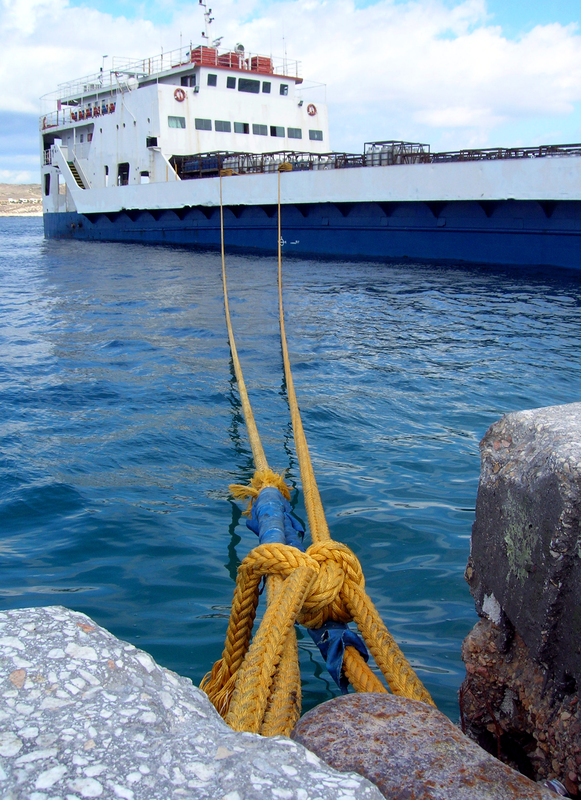 Our ferry to Paros and the other ships around this island were more than enough to satisfy my ship-seeing cravings. My dad on the other hand was ship-crazy enough to miss a day of shopping at Zara and Mango to see more of them. I know! That’s crazy, right? 4. But don’t forget to still make it special. So I just advised against this but sometimes their wishes should get a little preference over yours. It is their first trip after all and going out of your way to make it special is a nice gesture. Take time to snap lots of photos of them, even if you’re not usually a shutterbug. If they have their heart set on a nice night out, make a little room in the budget even if you thought it wasn’t in the cards. If you’re short on time, still make sure they have enough of it to hit that particular site they haven’t stopped yammering about since they first read about it in Lonely Planet. Stuff like that goes a long way toward ensuring a good first trip. I snapped away more than usual so he would come home with lots of good pics like this one. Any ships out there Dad? 5. Find a happy medium in the glass half full/glass half empty conundrum. In my experience, new travelers usually fall into one of two categories. The first, and less desirable, is the kind of person who complains about everything, compares everything to the way things are done at home and always comes to the conclusion that their way is far superior. Trying to pry this person’s mind open probably won’t do much good; you’ll probably just make yourself crazy beating that dead horse. If they insist on being a Negative Nelly throughout the whole trip, I would suggest simply not planning another one with them. The other type sees the new corner of the world through rose-colored glasses. Every new thing they see is the bee’s knees and every new place they go is better than the last. In theory, this is a great quality. In actuality, it can get a bit tiring… especially when things aren’t going that great. If you find yourself irritated, avoid doing the polar opposite and pointing out negative stuff to counteract their glass-half-full glass-overflowing view. Instead, agree with them when you agree, but don’t be afraid to keep it real when you don’t. Embracing a new place and a new culture shouldn’t mean losing all ability to opine about the things going on around you. All in all, the trip to Greece with my dad was one for the books. He learned a lot about traveling – beware of pickpockets, location trumps all when picking a hotel and you really can get by in a place where you don’t speak the same language. I learned a lot about my Dad – sometimes he still thinks of me like his little girl and doesn’t fully trust in my grown-up abilities to do things like figure out bus schedules or purchase metro tickets. 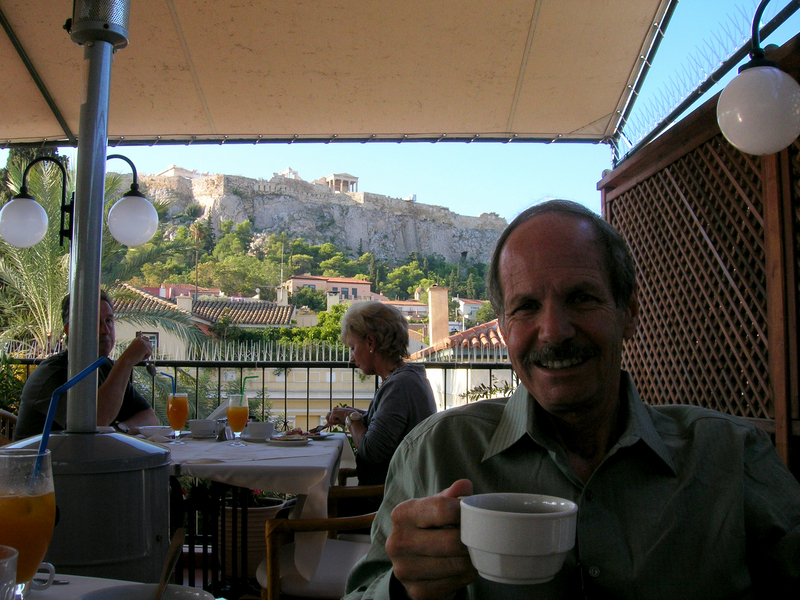 And we both learned a lot about Greece – the islands, the Acropolis and the ships and shopping (him and then me, respectively). Yeah, this town really exists. Could it be more beautiful? 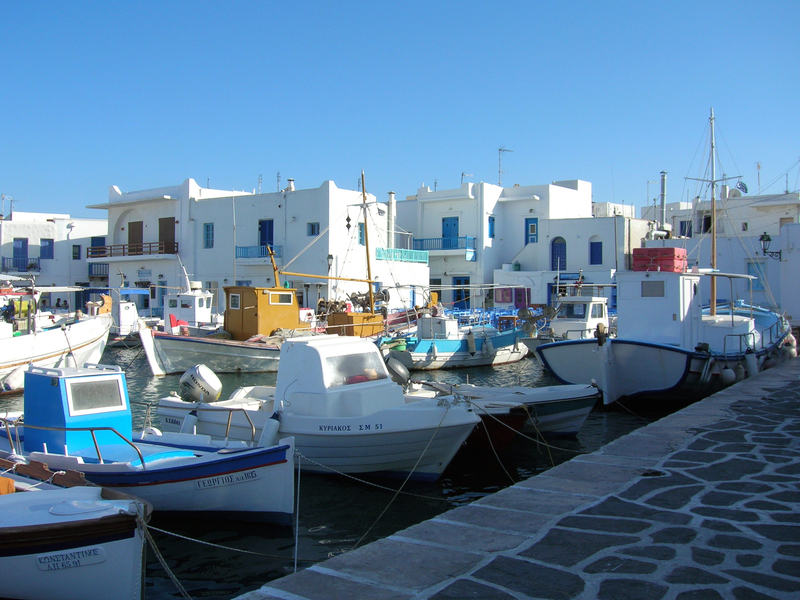 Naoussa, Greece on the island of Paros. No one around to snap a pic for you? I tell you how to take shots like this here! Apparently posing awkwardly with trees isn’t just a Tikal thing. I love reading your stories. Thanks for sharing. As long as I am taller than you, you will always be my little girl. However my hats are off to you and you sister for being the best a dad can have. You’ve become an excellent writer, very interesting and informative. The pictures are wonderful also! I am proud of you Julie, and of your sister too. You two were “my” girls in class, ever so many years ago, excellent students and oh so much fun to teach. That means so much coming from you! I’m so glad you’re enjoying my stories! Very nice article, just what I waas looking for.